Smart phones are the most coveted tech product at present. Everyone is craving for a new one or a better one. With many famous companies trying to hold their ground the competition in the market of smart phones is really high. If smart phone has been in your mind for some time you should definitely try the new Nexus 4 by Google. 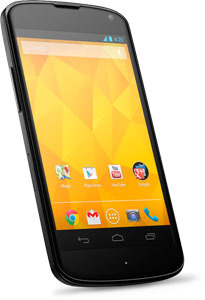 The new Google’s Nexus 4 is a smart phone that is sure to take your breath away. Maybe you have used the best products of similar type available at present in the market but trust us the Nexus 4 is far better than most of them. It has been much talked about and awaited by the tech-savvy generations. It has too many commendable features and is sure to capture a large market and fan following for it. If technology tickles your senses then Nexus 4 will rock your world. The Nexus 4 is surprisingly light and sleek. Its built is super slim and it is really light weight. The Nexus 4 has a back panel made of glimmering glass and its display is made of curved glass giving it a sophisticated yet very stylish look. The loudspeaker gives good quality sound and so does the audio system of the phone. The Nexus has a large 4.7 inch LCD display with high resolution and it enriches your experience of using the phone. Every frame is super sharp and brilliant to behold. It is really good for daily use and would continue to give you super fine picture quality. The text and videos on Nexus 4 will seem a lot more bright and sharper than in other smart phones. The finishing and detailing of Nexus 4 will leave you speechless as it is just perfect. The material used is hit and scratch resistant and very tough which makes it fit for daily use. Nexus 4 has two inbuilt cameras in it and the one in the rear is an 8 megapixel one. The picture quality is too good with each color defined and the texture smooth yet vibrant. The video quality is also awesome and using Skype and Google+ Hangouts will be a very pleasurable experience with the Nexus 4 and your peers would not believe that you are doing the video calls from a phone. The best thing about Nexus 4 is that it is powered by Google and Google empowers you through the Nexus 4. There are several features of Nexus 4 which are linked with Google. You get all your favorite programs, TV shows, e-books and magazines together at the Google play. There are more than 700,000 apps and games you can get access to with the Nexus 4 and upload your playlist in it. Nexus 4 gives you a chance to use the Google wallet which enables you to carry your credit and debit cards in your phone and use it in thousands of shops. Nexus 4 comes with an android beam technology which lets you transfer any data to another android phone with just a touch and tap.